A little while back, I wrote about the new Verismo machine from Starbucks that had been taking the coffee world by storm. With this splendid machine, not only can you create delicious beverages at home without the need of having to put on pants to go outside, but it also saves you up to 40% off of the same great coffee that you can get from your local store. Right now, you can save even more on this money-saving gadget since for a limited time, you can pick up the 580 system for $149. That’s a whopping $50 off the normal price! Looking for even more yummy, money saving goodness? Check out our Starbucks store page. 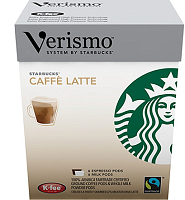 To make your coffee experience even sweeter, there’s also a free box of Cafe Latte Pods that is included with the purchase of a Verismo system. Sink your teeth into that deal! The system differentiates itself from other products in its niche as it features two separate compartments for the coffee and the milk, hence delivering an even richer experience. By inserting both the milk and coffee pods, you’re on your way to enjoying fresh, home-brewed coffee within seconds – just like they make in stores. I haven’t had the chance to try this unique system out yet, but any machine that will make a perfect Caramel Macchiato is number 1 in my books! Have you had the chance to try this system yet? Let us know what your thought are on it and if you will be taking advantage of this offer.